High expansion foam generator systems are common fire control and suppression systems for a wide range of hazards involved fire events including either ordinary combustibles, flammable or combustible liquids or combinations of these. High expansion foam systems are also used against LNG fires. These systems are designed according to the NFPA-11 or EN 13565 standards to protect hazards like storage warehouses, aircraft hangars etc. where the fire risk consists from variety of different materials and accordingly different reactions to fire. High expansion foam generating systems are the most effective solution for indoor spaces since they are used to submerge a fire and exclude the air needed to sustain combustion. The reduced water content of the expanded foam means that less water damage is inflicted on the items being protected within the site. In addition speed with which the system can totally submerge the hazard with expanded foam is the key measurement of performance and can dictate the number of foam generators required to protect the site High Expansion foam works very well for three dimensional fires. Fire suppression with High expansion foam generator systems lays on 4 principles: Smothers the fire, Insulates of the combustibles from air, penetrating effect of the water/foam solution and cooling. Applications of the High expansion foam is the most effective in total flooding of spaces such as warehouses, engine rooms, transformer buildings, cable tunnels, underground storage facilities, basements, ship's hold, and aircraft hangars. As well as being used on liquid fires, it is also very effective for fires in combustible solids such as paper and wood. The low water content of the foam means that less water damage is incurred and that goods are often still usable once the fire has been extinguished and the foam has subsided. Although it is possible to breathe when submerged in high expansion foam, it voluminous nature means that it can impede escape from the site. For this reason High Expansion systems are not recommended in areas where there are large numbers of people where evacuation of people is not rapid. High Expansion foam generators are used to expand the foam solution by using air sucked from the back side of the generator. Manufacturers of this kind of equipment use different principles like hydraulic water driven turbines, electric driven fans etc. C.S.I. S.r.l. produces high expansion foam generators with natural Venturi Effect principle that eliminates usage of moving parts that may create malfunctioning during years. 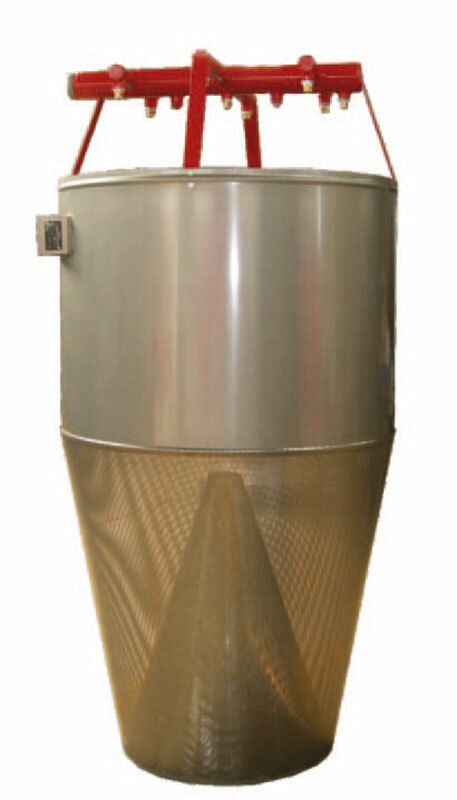 Foam Solution inlet collector is used to connect the equipment to the fire protection network and its other important function is to distribute the foam solution with a balanced manner to the nozzles while housing them. Inlet collector is not symmetric and nozzle connection locations are specially determined to maximize product performance. Standard construction materials of inlet collectors for HE-250 and HE-400 models are selected from ASTM A 106, ASTM A 105 Carbon Steel materials. On request, AISI 304 or AISI 316 Stainless Steel versions are available. 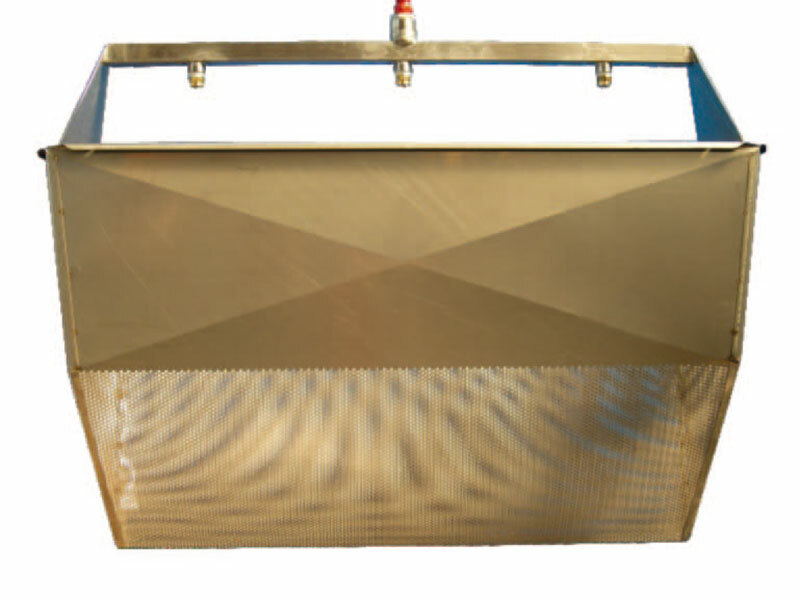 HE-100 model's inlet collector are made out of AISI 304 Stainless steel as standard.Connection of the equipment to the fire protection network made by threaded connections according to BSP. Sizes of connections are 2 A" DN 65 for HE-250 & HE-400 Models and 1" DN 25 for HE-100 Model. Different connection means as flanged, grooved or greater connection sizes are available on request. Additionally it is recommended to use strainers at the fire protection network or at inlet of each generator. The nozzles used at solution inlet collector of the equipment are specially engineered by C.S.I. S.r.l. to spray the foam solution onto the expansion screen homogenously to use efficiently all surface to expand foam solution. The nozzles are made of brass and stainless steel options are also available on request. Generator body made of Stainless steel, hanging equipment of the generator and creates a corridor between nozzles and expansion screen. Expansion screen made out of perforated Stainless steel sheet metals used to discharge/expand the foam solution. Product performance and functionality lays on no moving part principle and using the natural venturi effect. Mass of the foam solution sprayed into a closed sectional area, creates a thrust effect which moves environment air to enter into the foam generator body. Spray pattern creates a simple vortex and foam solution enters to the equipment gets mixed by air. Foam solution — air mixture crashes to the perforated expansion screen which ensures the expansion of the foam. AFFF-AR type foam concentrate ensures premium protection against polar solvents and hydrocarbons When a high expansion foam generator system designed according to CNPP approved system: does not require Fresh Air Supply, which gives possibility to work with internal air, so there is no air aspirating openings needed at protected space. Additionally where no air aspirated, there is no venting requirement. (*) Mentioned values are referred to purely achieved foam production capacity. Test hall conditions are already included at the achieved performance results.